Before the announcement by Sprint and T-Mobile of their merger, Reuters ran a story that suggested that a T-Mobile/Sprint deal “may cast shadow over tower companies”. The article points out that one of the major synergies of the Sprint/T-Mobile merger is “decommissioning cell sites”. No surprise here so far other than why the author of this article uses the word “may” in the title- there is no scenario where the tower companies are better off because of the merger than without it. So how is this a terrible not good very bad day for tower companies? 1. 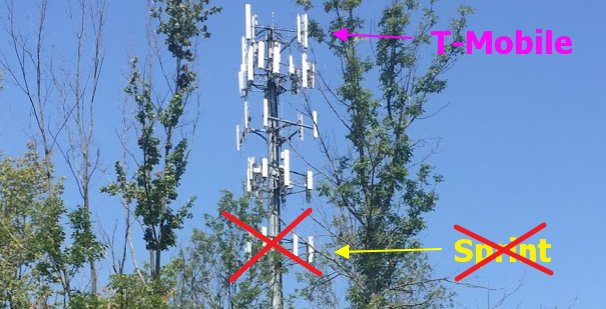 Lease Terminations Where Both Sprint/T-Mobile are on Same Tower. As the article points out – there is ~5% of the revenue from the tower companies where they exist on the same tower. American Tower put out a press release explaining that on towers where both Sprint and T-Mobile have cell sites, their leases represents 4% and 3% of AMT’s consolidated property revenue respectively. 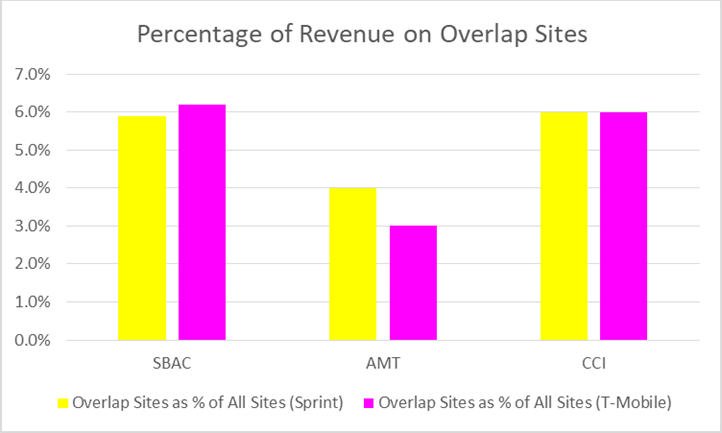 It’s just a matter of time (after the 3-4 years non-cancellable term), but most of the 4% of Sprint related revenue where both carriers are on the same tower will be gone. 2. Lease Terminations Where Both are on Nearby Towers or Structures. You may not recall but both Sprint and T-Mobile sold towers to multiple tower companies. (Sprint/Nextel sold to SBAC, CCI, AMT, T-Mobile sold to CCI and AMT and was the anchor on many of the build to suit towers purchased by SBAC). So, looking at same company towers ignores nearby cell sites on towers by other tower companies and even worse, those macrocells on non-tower company structures like buildings, water towers, and billboard. The numbers in the Sprint/T-Mobile presentation are simple enough – the combined company will emerge after a few years with 85,000 macrocells and 50,000 small cells. They indicate that 35,000 sites will be terminated which almost likely be Sprint sites and many of which are not on towers where T-Mobile is as well but on other towers nearby. 3. Fewer New Tower Collocations from Combined Companies. 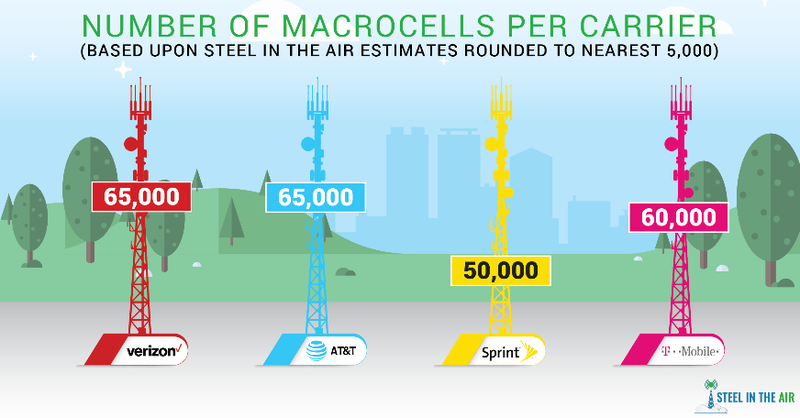 The tower companies and some analysts love to point out how after the AT&T and Cingular merger or the Sprint and Nextel merger that the combined company ultimately deployed more macrocells than were ultimately terminated. Even assuming that factually this is correct (it’s not for all mergers) there are two significant fallacies in this argument. First, it presumes that still even more sites wouldn’t have been built if the combined companies had stayed separate. Fallacy #2 is that the period after these mergers was the onset of 4G and the first round of LTE buildouts, both of which caused a significant amount of cell splitting and infill. That simply won’t be the case this time around. 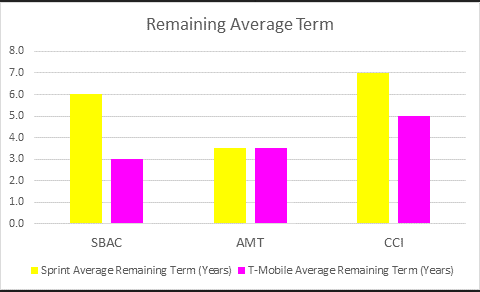 The merger announcement clearly demonstrates that T-Mobile and Sprint are indicating that they intend to decompress (the opposite of densify) their network from 110K current macros to 85K over a few years period. This means 25K fewer macros after accounting for 10K new macros and 35K decommissioned macros. Surely this is less than would have been added by both companies separately. Furthermore, we suspect that the MLAs with the tower companies will mean that many of the new macros will just be replacements of some of the 35K decommissioned macros- yielding slightly less terminated sites for towercos- but also fewer truly additive new colos over time. As an interesting aside – this also impacts tower companies that are building towers near existing public tower company towers in order to encourage carriers to move off the public tower company tower. With one less potential tenant on ALL towers, what was a slim margin business model becomes even slimmer. 4. Less Upcoming Modification Amendment Activity on Existing Towers. For the first time in a while, both T-Mobile and Sprint are actively modifying existing cell sites by adding new antennas or replacing existing antennas. These new antennas are significantly larger than the existing antennas due to incorporating MIMO or multiple carrier aggregation. This modification revenue (and guidance related to it) will be reduced. We suspect that Sprint won’t be willing to completely stop its modification activity while waiting for regulatory approval, but there will be adjustment and prioritization. They won’t sink money into the 35K sites that are likely to go away. There may be a delay while the two companies try to rationalize their deployment efforts and determine what technology choices best work for the combined company. To make matters worse, not only do the tower companies lose some of the current already slated (and included in guidance) modification activity, but also any future amendment activity on top of that from any new collocations and any of the terminated sites. SBAC and AMT can’t be happy with the timing of this announcement- one and two days respectively before they announce their earnings. Should be interesting to see how they make lemonade out of these lemons. This won’t significantly impact AMT or SBAC, but it will impact CCI. While the combined company will be larger in terms of pops, we won’t remotely see the same number of small cells from the combined company as we will from each of them separately. During the investor call on the merger, they directly indicated this. Furthermore, with AT&T and Verizon more than capable of going it alone on the small cell front due to the substantial fiber holdings, Sprint and T-Mobile both seemed primed to use a third party small cell developer like CCI because both lack any substantial fiber of their own. CCI keeps comparing small cells today to towers in the early days. A post T-Mobile/Sprint merger environment has 3 active participants, whereas the late 1990s- early 2000’s tower environment had 6-7 active participants in most markets. (Don’t even get me started on the Facebook like argument that TMO/Sprint seems to be preparing to argue that 5G has 6-7 active participants). There fundamentally cannot be the same upside in a three-carrier market especially when the third carrier just announced that they intend to primarily use macros and superior spectrum to densify their network for 5G. Personally, I don’t believe that T-Mobile/Sprint will be able to support true 5G use cases with 50,000 small cells, but this merger if consummated definitely causes greater concern over the returns from small cells. Fortunately for CCI, they already announced earnings, so it may be a while before we get any substantive guidance from them. Nonetheless, the ROI for their fiber acquisitions just got a bit longer. All in all, yesterday wasn’t a very good day to be a tower company. Want to know more? Contact us to schedule a paid expert engagement with Ken Schmidt.